A blogger who has taken former Scottish Labour leader Kezia Dugdale to court said it was "absurd" to interpret one of his tweets as homophobic. For live updates on Monday's proceedings follow @BBCPhilipSim. Pro-Scottish independence campaigner Mr Campbell wrote: "Oliver Mundell is the sort of public speaker that makes you wish his dad had embraced his homosexuality sooner." Mr Mundell's father, Scottish Secretary David Mundell, came out as gay in January 2016. Ms Dugdale wrote in her column in 2017 that she was "shocked and appalled" about what she described as "homophobic tweets". She added that "such comments are of course not unique to the man who tweets as Wings Over Scotland", saying the account "spouts hatred and homophobia towards others". Ms Dugdale later called on SNP politicians to "shun" Mr Campbell during First Minister's Questions. Mr Campbell subsequently launched legal action, arguing that while his tweets could be "rude" he was "absolutely not" prejudiced, and saying Ms Dugdale had defamed him by suggesting he was homophobic. Ms Dugdale's legal team submitted to the court that the article was a "fair and honest comment" criticising Mr Campbell for "giving voice to homophobic sentiments". The UK Labour Party previously paid for Ms Dugdale's representation in court, but cut this off in September last year. Mr Campbell told the court that his tweet was making a "commentary" that Oliver Mundell was "a very very poor public speaker". He said: "I don't think any intelligent person could honestly interpret that tweet as being homophobic." The blogger agreed "very much" with his QC that it was unacceptable for someone to be mocked on the basis of their sexuality. He added that he was a "firm advocate of equal rights for gay people", saying anyone who had read his Twitter feed or website would find it "ludicrous" to think he was homophobic. While being questioned by Ms Dugdale's legal team, Mr Campbell said someone would have to be "dishonest or stupid" to think his tweet was homophobic. Mr Campbell was then asked if he thought Nicola Sturgeon was being "dishonest or stupid" in her response to the tweet during First Minister's Questions. He replied that he did not believe she made any "specific reference" to his tweet, but if the first minister believed it was homophobic then she was being stupid. The court examined a series of other tweets Mr Campbell had sent in the past, dealing with issues ranging from video games to gender self-identification. He denied any of them were evidence of homophobia or transphobia. Paul Kavanagh, author of the pro-independence blog Wee Ginger Dug, and director of Stonewall Scotland Colin Macfarlane were also called as witnesses. Mr Kavanagh told the court he personally did not think the 2017 Mundell tweet was homophobic, and had not seen anything on the Wings Over Scotland blog that he considered homophobic. He said that for a blogger, being called a homophobe was like being called a racist or a holocaust denier. He added that it "destroys your credibility" and makes it hard for you to "reach no voters or people who are undecided." "It has a very damaging effect," he said. Meanwhile, Mr Macfarlane said he was "disappointed" by Mr Campbell's 2017 tweet, saying it was "wholly unnecessary to reference David Mundell's sexuality" and that it had been made the "punchline" of the tweet. 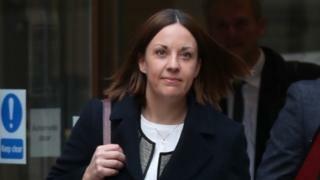 Ms Dugdale is expected to give evidence on Tuesday, while the court heard that David Mundell had invoked parliamentary privilege and would not be appearing.